Chutney, Preserve, Pickle, Salsa these were the few areas I was thinking and making almost a month ago. Many a times when I go for weekly grocery shopping I go overboard with fresh veggies & fruits. So trip to 2 different grocery stores in a day & a trip to peach orchard in the same weekend end result sweet & sour yummy treats. Though I've made quite a few Chutney's & Pickles etc. in the past few days like Mango Chunda/chutney/preserve but today it's Peach time. Most of them were eaten just like that & few firm ones were turned into Salsa & riped ones were turned into peach preserve & finally over-riped were turned into cold treat peach ice-cream. 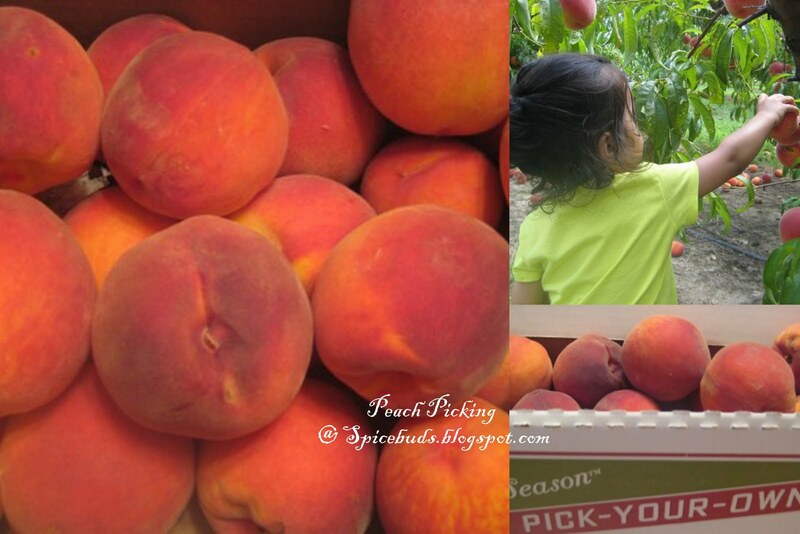 Fruit picking is one thing which not only kids enjoy but we as an adult also enjoy it equally. I still remember first time when we took our then 3 yr. old daughter for her first strawberry picking she was excited but Dad was over excited to get the freshest and juiciest fruit that I came back home with almost 15 pounds of fresh strawberries. I prefer to eat fruit just like that but that was the first time I started to make strawberry preserve, since then it's regular in my house. Now some recipes to use up all the juicy peaches no matter whether U picked up yourself from the orchard or from the local farmers market. Peach Salsa : I have to say this was among one of the best salsa I make, not only because we adult loved it but my 8 yr. old said she loved the combo I made, when I asked u liked the salsa, she replied whatever u call it(in her world salsa is either red or green) it's tasting good with this chicken tikka & pasta salad(that was the dinner). It's more of a guideline then a recipe U can change the fruit & veggies that goes in as per your taste or availability, also adjust the spices level as per your taste. What to do : Chop everything into small pieces except lime. Mix it in a big bowl, add black pepper, salt & cumin powder, squeeze the lime juice on to the mix. Mix it, taste it, if needed adjust the seasoning, cover it & keep it in the fridge. I prefer to make fruit salsas on the same day, usually 2-3 hours before I need it. If for some reason you want to make them ahead of time(in case of party or so) don't mix salt, cilantro and lime juice, get everything else ready & keep it in the fridge. When ready to use add salt, lime juice & freshly chopped cilantro. You can serve it with Tortilla chips. pita chips or as a side for grilled fish or chicken, it goes well with roti(Indian flat bread) & rice also. Variations : I make same recipe using mangoes also & mixing both fruits peaches as well as mangoes. If u want to make mango version only, try this one 1 mango + 1/2 cup of pineapple & leave the cucumber & tomato out, plus rest of the ingredients from the list, tastes awesome. Remove the skin off from the peaches(see notes). Roughly chop them, remove the stone/seed. In a non reactive pan add peaches & sugar let it sit for an hour or so. Add all the spices cook the mixture for 20 minutes or so on med. heat. Check the sugar level U can add more at this point if U like, these peaches were very sweet so I didn't used a lot of sugar. Add Vinegar & cook till all the water evaporates around 5 minutes or so. We don't like fruit preserves to be very thick. So I cook it to the point where it's still little loose as when it cools off it gonna get thicker. To check that, preserve should coat your spoon but if u take the spoon out preserve should drip like honey. Peach Ice-Cream : I didn't took any pics, sorry about that. It's same recipe as Mango Ice-cream we used around 4 large peaches fully riped. Take the skin off(see notes) & remove the seed also. Roughly chop the fruit & sprinkle 2-3 tablespoon of sugar from the total sugar u r using. Leave it for around 2 hours in the fridge. Pulse the fruit pulp in blender making sure it's not fully pureed as we like little bites of fruit here & there in ice cream. Now follow the same directions as we did in my previous ice cream. In case of fully ripe skins, usually u can simply peel the skin off using your fingers(first make a little cut on peach using knife). In case of firm ones boil a pot of water & add few peaches at a time in it for 40-60 seconds then transfer them to ice-cold water for a minute or so & now u can peel the skin off. Enjoy the last bits of summer. I've never seen such a great season for peches; I have been buying a basket evey week; love the look of that salsa and chutney. Oh my. that is definitely quite industrious and versatile. Loved all the recipes. I love especially the preserve. Awesome looking salsa andpreserve, love peaches anytime..
market sure is full of peaches this year; but somehow i feel the punch is not there in the fruit this year.. may be due to the light summer in the bay. peach preserve sounds delicious, i'll surely try it soon. Yum, all three recipes sound and (and in the case of the first two) look delicious. I love the salsa in particular, so unique. Hi spice thanks for visiting me. you have a lovely place here. loved your chunda recipe. the peach preserve looks tempting. I am yet to bring peaches home this year. Oh lovely!! Peach preserve and peach ice cream.. drool! :-) Am sure both taste fabulous!! Really versatile peach recipes. Luv it. Gr8 space. Yumm.. Peach ice cream sounds tempting and so does mango ice cream..!!! off to check it out now!! Contact me immediately. The winner for the giveaway has been announced and your email bounced back. Please send me your correct email address right away. Please send me your email address.. write to me at ecurry.admin@gmail.com. The email address that appears in your comment as spicebuds@google.com is bouncing back. if I/csn promo team cannot have the correct email, they cannot contact you to deliver the certificate. That's a lot of peach! Nice post! A round-up in itself! Cheers! What a great and informative blogpost! Thank you! I will be trying this out very soon! Hey Spice!! How u doing?? I have passed on an award to you on my blog, please do accept..